LOMBARD, IL — November 11, 2016 — Pernix Group, Inc. announced the award of two new projects recently awarded to its wholly owned subsidiary, Pernix Guam LLC. The $26.4 million dollar contract with the Naval Facilities Engineering Command (NAVFAC) for the low observable/corrosion control/composite repair shop was awarded on September 30, 2016. This contract is for the work to provide environmentally controlled areas for on-aircraft low observable restoration and repair in support of the Guam strike mission at Andersen Air Force Base, Guam. 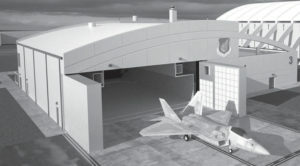 The work to be performed includes the demolition of the existing composite shop and relocation of the existing cargo deployment facility (CDF). Additionally, the existing air freight terminal will be renovated to accommodate the relocated CDF and cargo reception facility. The project is scheduled for completion in October 2018. Pernix Guam LLC also received a contract with Guam Waterworks Authority (GWA) in August 2016 for the $18.2 million dollar Yigo and Astumbo Reservoir project. This project consists of the construction of three 2 million gallon pre-stressed concrete water tanks located on two different sites as well as the inspection and repair of an existing 2.5 million gallon steel water tank. The contract also includes demolition work, construction of vaults, valves, meter, booster pumps, control building, site pipelines and appurtenances, earthworks, civil work improvements, design build of approximately 3,500 lineal feet of 12” diameter water lines, and mechanical and electrical work. The project is scheduled for completion in December 2018. Pernix Group, Inc. is a construction company recognized by Engineering News-Record for being one of the Top 50 American Contractors Working Abroad for the last five years. Headquartered in Lombard, Illinois, Pernix has operations in the United States, Europe, Asia, Africa, the Middle East, and the Pacific Rim. Pernix has full-scale construction and management capabilities, in three primary markets: Federal Government, Commercial & Industrial, and Power. Additional information is available at www.pernixgroup.com. Certain of the statements made in this press release are forward-looking statements within the meaning of the Securities Litigation Reform Act of 1995. Such statements involve certain risks and uncertainties that could cause actual results to differ materially from those in the forward-looking statements. Potential risks and other factors could cause or contribute to actual results differing materially from such forward-looking statements.